Bisque clay pots at East of Java, 1421 S. Beretania St. stand 31 to 41 inches tall. Those with incised patterns are priced at $80 to $95 and those with ribbed patterns run $70 to $85. East of Java, the Asian emporium of exotic furniture and accessories, has moved west -- just a little. Once nestled in the far corner of Manoa Marketplace, they've quietly relocated to 1421 S. Beretania St.
At the old spot, proprietor Sui-Lan Ellsworth saw a steady stream of walk-ins from the university set and curious patrons from nearby restaurants. Since the move, she's found that if you've got "It," they will come. The store's inventory includes banana-leaf woven ottomans, triangle pillows, teak daybeds, furniture-grade bamboo in assorted colors and more. 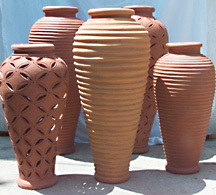 Bisque clay garden pots, shown at right, add a sculptural element to a landscape, garden, lanai or entryway.